ClassWish has partnered with a national, educational book wholesaler to provide a tremendous selection of books for your library or classroom. We offer more than 30,000 titles from more than 400 publishers, from large multi-national houses to niche publishers who focus on a specific field, topic or age group. Just visit follow the instructions below to place your request for the titles you want using the funds you raise through ClassWish.org. If you want more books than your balance allows, you can make a tax-deductible contribution to your own wish list before or right after you submit your request to us. 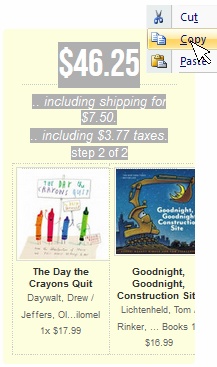 When you have donation funds to use (or are about to add your own funds), go to http://www.classwish-books.org/ (To see other vendors for other categories, please go to the home page of this ClassWish vendors site). Select the books of your choice. Then proceed to Checkout. Now you´ll find your self at the Shopping Cart site. Please copy the content of the Cart. We need to know the books title, price, quantity and ISBN. See image below. Download this ﻿Request form﻿, and paste the entire Cart contents into that Word document. After doing this you can now proceed to Checkout. You do not need to fill out the three boxes you will see on the Shopping Cart site. Just proceed to the bottom of the page and press the "proceed to Checkout" button. Provide the school address as your shipping address and continue to the next step. Please note that the discount and donation offered on purchases are not applicable for books obtained by using your donated funds. Now, copy the price total that appears on the right side of the page, including shipping and taxes, and paste it into the Request Form. It is important that you do not copy it until after you have provided the school's address, so the site will calculate the shipping charges. See image below. The wholesaler will ship the books to your school. Most orders will arrive in 5-15 business days. Please note that books cannot be returned. We are delighted to be able to help you and your students get the books you need.